This story was updated at 9:58 a.m. EST on April 25. Upwards of half a million people are expected to crowd Florida's Space Coast next Friday (April 29) to watch the space shuttle Endeavour lift off one more time. NASA also sells tickets to secondary sites at its Kennedy Space Center Visitor's Center, and at the U.S. Astronaut Hall of Fame. Unfortunately, tickets for all three sites are long gone. If you haven't already ordered one months in advance, forget about it. But fear not, for fantastic views are easy to find – and free – throughout the space coast. The town of Titusville, about 12 miles across the Indian River from Kennedy Space Center, is a premiere spot. Its numerous parks along the water, including Space View Park and Parrish Park (which is located on the causeway between Titusville and the space center) are top choices for shuttle watchers. "Titusville is definitely the place to go," said Ben Cooper, a space photographer for NASA and other media outlets. "It has the best view — there's no comparison." "That's the second best place after Titusville," Cooper told SPACE.com. "The view in my opinion is not as nice, because it's got telephone wires. But other than that there's no other place you can go where you can see the launch pad itself." Nearby Cocoa beach is also a popular location. Once you've decided where to go, you'll have to weigh rest and convenience against the necessity of heading out early for a primo location. With Endeavour's liftoff toward the International Space Station scheduled for April 29 at 3:47 p.m. EDT (1947 GMT), folks should probably plan on arriving at public parks at least six to eight hours early to stake out a claim. "I think it's going to require getting there earlier than usual," Cooper said, given the high-profile nature of this final launch for Endeavour, the penultimate launch of the space shuttle program. "For this one, probably get there in the morning. If you have camera equipment, I would get there when the sun comes up." The largest crowds will likely show up a few hours before liftoff, while the most industrious will probably camp out overnight. 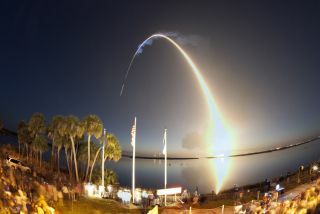 "I would go early in the morning and just plan to spend the day," said Robert Varley, executive director of Florida's Space Coast Office of Tourism. Cooper recommends trying to do some of both. He also suggested bringing a tripod and setting up the shot so that the camera could fire away automatically while you bask in the scene. Other must haves are a blanket or chair, snacks, a book, and games for your kids to play to while away the waiting hours. Bug spray and sunblock won't go amiss either. Finally, a handheld radio or scanner will allow you to tune in to NASA TV for countdown commentary to stay abreast of developments that could impact launch. If the weather isn't clear or a technical glitch arises, NASA will have to scrub the launch for the day and try again later. If you can't make it to Endeavour's STS-134 liftoff, NASA plans one more shuttle flight. On June 28, the shuttle Atlantis is slated to launch to the International Space Station, capping off the space shuttle program's 30-year career. While near record crowds are expected for next week, the Atlantis mission will likely top even that. Varley predicted that over a million people would turn out for their last chance to see a space shuttle blast off this summer. "It's like everybody's looking on their bucket list and going, 'Ooh, I haven't seen that yet,'" Varley said. "It's just phenomenal." Despite the crowds, seeing the shuttle's blindingly bright flame tail and feeling the roar of the rocket's engines is an unforgettable experience. "In my opinion, it's worth fighting the crowds to see something that's never going to happen again," Cooper said. But, if all else fails, you can always catch a live feed of the shuttle launch on NASA TV.